Xiaomi is a Chinese smartphone company, that develops, manufactures, and markets Android handsets, laptops, mobile apps, and other consumer electronic products. The Xiaomi Redmi Y1 is a budget smartphone recently introduced for the selfie lovers in India. The smartphone presents a metal body that gives a rich flagship-like feeling. Let's take a look at the Xiaomi Redmi Y1 specifications to know whether its worth the price tag or not. Under the hood, lies an Octa-core processor which is clocked at 1.4GHz and seated upon a Qualcomm Snapdragon 435 chipset. This is further mated with 3GB of RAM thereby ensuring a smooth and seamless performance besides aiding lag-free multitasking.The Octa-core processor aids in handling tasks with ease. It supports trouble-free execution of gaming and emailing applications among other stuff. In terms of software, The Redmi Y1 runs on Android 7.0 OS. For image crazy people, the Xiaomi Redmi Y1 is armed with a standard 13 MegaPixel primary camera and an awesome 16 MegaPixel front camera. The rear camera is as well supported with an LED flash to shoot dim-light picture and videos while the front-facing camera can be used for video telephony. You can keep your selfie game strong and effortlessly capture sharper and gorgeous self-portraits. Beautify 3.0 option improves your natural looks while maintaining original facial details intact. On the resides a 5.5-inch HD LCD display, which is quite bright and does a decent job. However, clarity in outdoors is a concern like in most affordable smartphones. At the rear, a fingerprint reader is present which has been the norm predominantly in Redmi gadgets. The fingerprint scanner is placed below the main camera unit. To unlock the device, one has the choice of registering multiple fingerprints. Fingerprint scanner option further enhances the security of the handset. Despite sporting such a big screen, the device sits comfortably in one hand. The resolution of the screen is 720 x 1280 pixels. 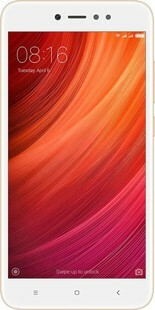 The presence of a large screen size in the Xiaomi Redmi Y1 provides a superb experience while watching videos, reading, and browsing the internet. It is a flawless media consumption gadget which allows you see more and also do more. The Xiaomi Redmi Y1 is fitted with 32GB of internal storage support. One of the nice things about the device is that it comes with an external MicroSD card slot. The storage is expandable through a MicroSD card up to 256GB. The Redmi Y1 is designed for longer battery durability and packs a non-removable Li-Ion 3080mAh battery. According to the company, it offers up to 21 hours of reading 10 hours of video replays and 12 hours of gaming. The Redmi Y1 is stunningly handy and appealing device.The handset is sold at an affordable price point. It complements its price with nice features in every area, especially an octa-core processor and durable battery, Big HD display, and fingerprint sensor. You can certainly go for it. Xiaomi Redmi Y1 full specs and reviews as of Apr 2019. Buy it here!